If you’re doing a lot of car repairs, you know that sometimes it’s useful to remove fuel from a car and put it elsewhere for the time being. Likewise, if you’ve ever found someone on the side of the road who had run out of fuel, you’d be much more capable of helping them if you had a fuel transfer pump. But you’re not going to use a fuel transfer pump every day, most likely. You might not know what to look for when purchasing such a pump. In this article, we’ll explain everything you need to know about fuel transfer pumps so that you can make a good purchasing decision. How Long Should My Fuel Transfer Pump Last? How Do I Make My Transfer Pump Last Longer? How Much Gas Should I Plan To Pump? Are All Fuel Transfer Pumps Compatible With All Cars? Now that you are acquainted with several fuel transfer pumps, you can start to think about which one is right for you. Your general choices are wall-powered pumps, battery powered pumps, and manual pumps or siphons. The wall-powered pumps are indisputably the fuel pumps with the highest pumping rate and longest duration of pumping at a stretch. Wall-powered pumps are often much harder to clean, however. Their durability is very high. The lack of mobility makes them difficult to use in many situations. Nonetheless, wall-powered pumps rarely have any issues with short tube lengths. Battery-powered pumps are the most common fuel transfer pumps. Battery-powered pumps use D batteries. This makes them a bit heavy in your hand. Battery-powered transfer pumps are also constrained by their battery life. They also typically have a very short hose length, which can make your life difficult. The problem with battery-powered pumps is that batteries tend to lose charge over time even if they are not being used. When you need to rely on them, they might let you down. Likewise, battery-powered pumps can’t pump very much gasoline. Battery-powered pumps are the only choice for many people when it comes to a portable pump, however. You may find that battery-powered pumps have a fast enough flow rate for your needs. Sometimes, the pump of battery-powered pumps can fail, however. Manual pumps or siphons are the second most common type of fuel transfer pump. The biggest advantage of these pumps is that they are never going to run out of power so long as you have the energy. These pumps are also very durable. You won’t need to worry about breaking the pump itself. For many people, the manual aspect of the pump is the dealbreaker, however. It takes a lot of effort to move any appreciable amount of fuel. You will get tired. This means that they might be the last thing you want to use in an emergency. On the bright side, they will always be there for you in an emergency. 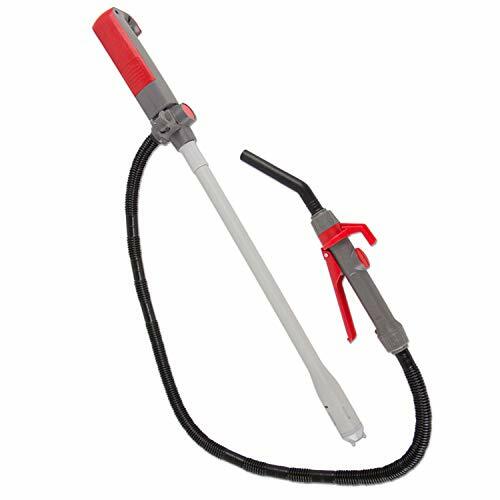 Manual pumps tend to have hoses of decent lengths, so you won’t need to worry very much about being able to reach. The Fill-Rite FR1210G is a heavy-duty and powerful fuel transfer pump which is suitable for use in the shop. 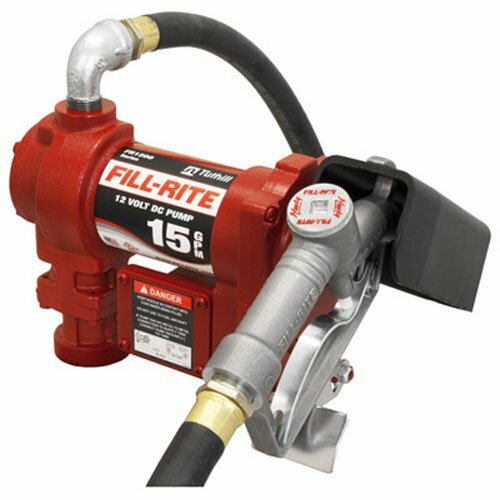 The Fill-Rite has most of the features you’d want from a fuel transfer pump. Capable of 15 gallons per minute, the Fill-Rite can also exert over a bar of pressure. Because it has a 12V motor, you’ll need to have the pump plugged in while you use it. Likewise, the unit itself is fairly bulky owing to its powerful motor. This is the same quality of fuel pump that you find at gas stations, but it doesn’t have quite as much protection around the form factor. No matter whether you intend to pump diesel, biodiesel, gasoline, ethanol, or methanol, the Fill-Rite will do the trick. The only real issue with this unit is that it isn’t portable whatsoever and that it requires a bit of mounting to an external surface to be used comfortably. 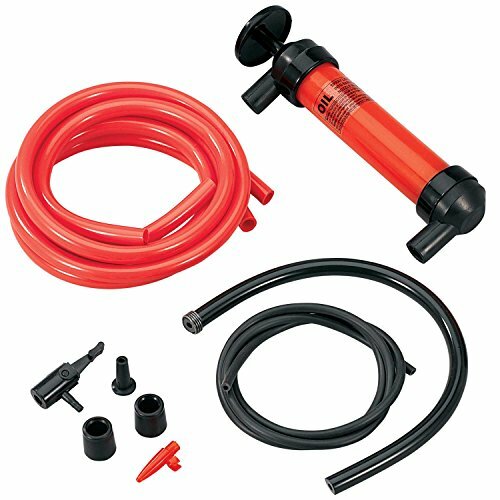 The TeraPump A-TREP01-001 is a super-portable and versatile fuel transfer pump which you can throw into your trunk to prepare for any eventuality. The TeraPump is a great example of a simple and lightweight fuel transfer pump. The power source for this unit is a battery in the hilt of the pump. You won’t be able to use this pump indefinitely on a single charge, but it will be enough to get someone to the next gas station. Operation of this pump is extremely easy. The single button makes it so there is little confusion about what button to press or where to put each end of the pump. There is also a fast-stop switch which is intuitive to use. The pump offers a 2.4 gallon per minute flow rate, and can pump all common chemicals and fuels. It isn’t rated for pumping drinking water, however. 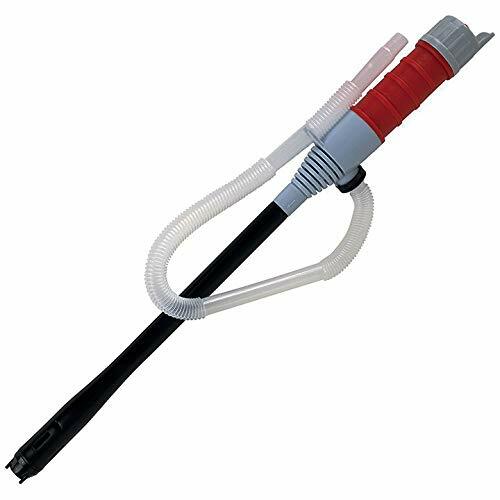 The main drawback of this unit is that the hose length is very minimal. You will need to have the fuel source very close to the intended destination — no more than a couple of feet at the very most. This makes it a big cumbersome to use at times because there is not always sufficient room for a person to get in between two cars that are parked that closely together. Nonetheless, this fuel transfer pump is an excellent option for anyone seeking a simple solution. The Sierra Tools Battery-Operated Liquid Transfer Pump, Model# JB5684 is the minimum viable fuel transfer pump that takes up practically no space and has scarcely any weight. The Sierra Tools pump is run by a battery in the hilt. This unit is practically as light as air. The build quality isn’t the best, but for something you don’t intend to use very frequently, you won’t notice any problems. The flow rate of the Sierra Tools pump is less than a gallon per minute, which means that it is mostly restricted to emergency use. Nonetheless, it’s a very inexpensive choice for a fuel transfer pump. You can pump most common liquids, but detergents or corrosive liquids are not compatible. The hose length of the unit is also fairly small, but it’s workable. The Koehler Enterprises RA990 Multi-Use Siphon Fuel Transfer Pump Kit is a manually operated pump that you can rely on no matter what. As a manually operated fuel transfer pump, the Koehler has a lot of competition which can do the job faster. Electricity-powered pumps simply can’t keep working indefinitely, however. For all the huffing and puffing you’ll need to do if you want to transfer a tank’s worth of fuel using this pump, it will work even when the power is out and there are no batteries anywhere to be found. 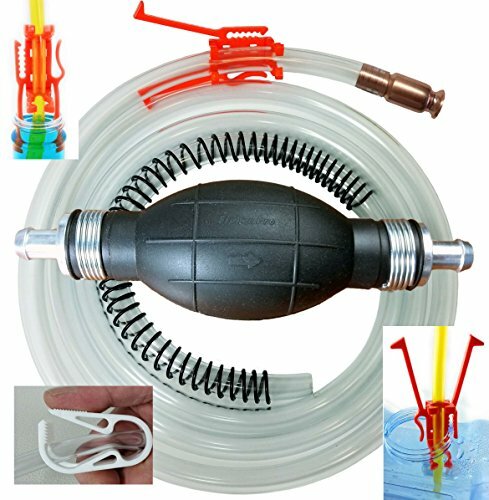 This pump is easy to operate, has several replacement parts, and is very durable. You will not be let down by this pump so long as you recognize you will need to do a lot of pumping to get anywhere. The pump’s simple design makes it very durable. Likewise, the pump itself is very light because it has no batteries or electronics inside. The downside is that you may have a hard time figuring out how much gas you have pumped using this unit. There isn’t exactly an automatic stopping mechanism, and you may be inclined to check your progress a bit too frequently owing to the exertion. The Siphon Pro XL is another manually operated pump that has a high potential flow rate owing to its excellent design. The Siphon Pro XL is a manual pump which can move up to four gallons of liquid per minute if it is used correctly. This means that at its best, the Siphon Pro XL can pump faster than some powered fuel transfer pumps. Nobody is saying that getting this kind of mileage out of the manual siphon is easy. Nonetheless, it means you won’t need to exert yourself as hard to get fairly good results most of the time. The pump manages these impressive results by utilizing simple and high-throughput parts that are augmented by gravity. There is also a convenient hose clamp which you can use to stop the flow, though it is a bit awkward to do quickly. The hose itself is very long, and resists kinking and knotting. You will learn to appreciate these features if you ever use a different fuel transfer pump. Wall-mounted fuel transfer pumps have a lifetime of 10 or 20 years. Other types of fuel transfer pumps have significantly shorter lifetimes. Battery-powered fuel transfer pumps have a short lifetime because of their small and unreliable motors. These pumps also typically have weak hoses and gaskets which do not stand up to repeated stress. Manually-powered-pumps last longer than battery-powered pumps, and their hoses are often of higher quality. Assuming equal use, the best way to make your fuel transfer pump last longer is to only pump one kind of chemical. While most pumps are rated for fuel and other chemicals, the more you mix the chemicals the higher chance there is of a resin building which will damage the tubing. Likewise, the pump chamber can become damaged if there are many different chemicals cycling through it. It’s hard to say exactly which chemicals you will be pumping that will cause a problem, but even something as innocuous as high mineral content water can cause problems eventually. Cleaning your fuel transfer pump with a cleaning solution provided by the manufacturer after every few uses will do a lot to preserve the tubing. As far as the pump mechanism goes, there isn’t too much you can do to prevent it from accumulating wear and tear. If you are moving gas around in the garage in the context of a repair shop, you should plan to pump gas on the order of a hundred gallons. This will ensure that you will pump gas at a fast enough rate while working. For keeping in your trunk, you won’t need to pump nearly as much gas. If there’s an emergency, you need to be able to transfer gas on the order of five gallons. Five gallons of gas should give someone enough time to get to another gas station. This is the sweet spot for battery-powered fuel transfer pumps because that is the quantity of fuel they can typically pump in about a minute. For gas around your home garage or perhaps another car, you need to pump about ten gallons per minute. This means that a battery-powered fuel transfer pump will work fine, as will a manual pump. If a product is marketed as a fuel transfer pump, it will only be compatible with cars that take the fuels the pump is rated to transfer. For the most part, this means that fuel pumps will be compatible with all cars. There may be a few situations in which a fuel transfer pump is not rated for the kind of gas your car needs, however, so you should double check.